There is increasing interest in eating disorders occurring during midlife and later. A new volume from Dr. Margo Maine, PhD, longtime author and clinician, and Joe Kelly, author, editor, and founder of the national advocacy nonprofit Dads and Daughters, examines this issue in detail. 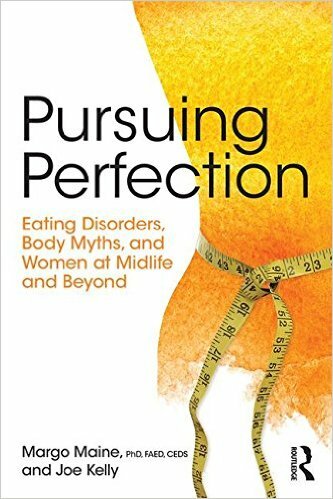 Pursuing Perfection: Eating Disorders, Body Myths, and Women at Midlife and Beyond examines this interesting and timely topic in detail. The first chapter addresses “The Changing Shape of Womanhood.” The authors then describe eating disorder symptoms and behaviors in women beyond the traditional age when eating disorders are diagnosed, and agree that eating disorders are common at midlife and beyond. Sociocultural forces in evolution are examined, and the role of perfection is introduced. Subsequently, the book addresses the role of adult developmental experiences and eating and food choice behaviors. A number of related topics are also touched upon, including body dysmorphic disorder and plastic surgery. The authors also examine the roles of both culture and family environment, and how these influence the development of disordered eating attitudes. Particularly interesting is the conceptualization of the current culture as “The New Extended Family.” Finally, an informative chapter, “The Shape of Recovery,” explores the experience of recovery by women in midlife.